Currently I have my layout wired "home run" or "star" everything under the layout running back to terminal next to transformer. Everything works fine. 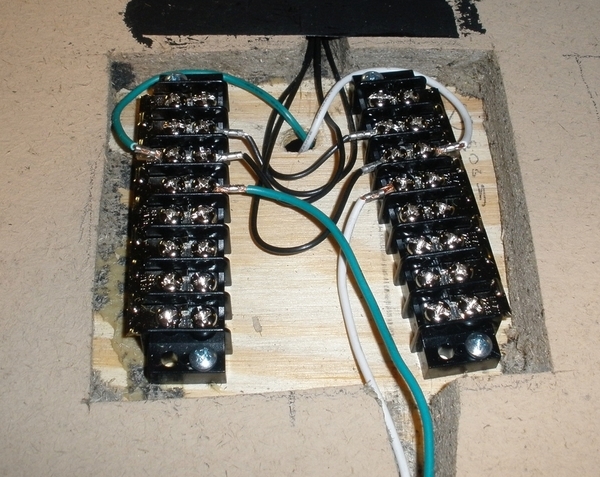 My layout has 3" pink foam base so easy to cut channel in and hide wires from switches etc. I plan to bring them to the edge and attach to bus wire I think. 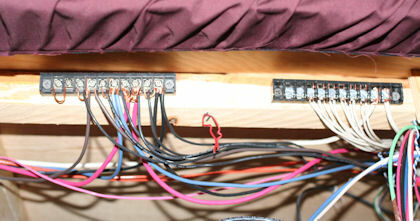 With table edges constructed for front wiring my terminal strips are mounted on 2" x 2"s and maroon skirting covers them. Skirting flips up for access. Note to self, trains won't run on skirt. Susan, many thanks ! That is great idea. I can certainly do that ! I also like the information on your layout website. There is much to explore there. Thank you very much. Steve, thanks for the link. Those would work well for what I will end up doing. 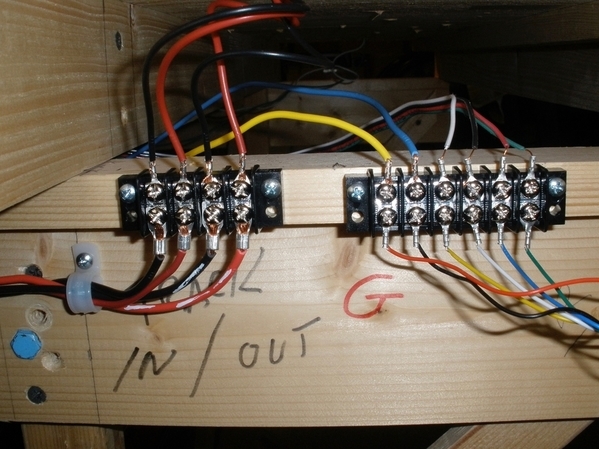 Common wiring done with electrical panel neutral bars. Accessory and track common use the same bar(s). Hot wiring done with Buss fuse blocks. 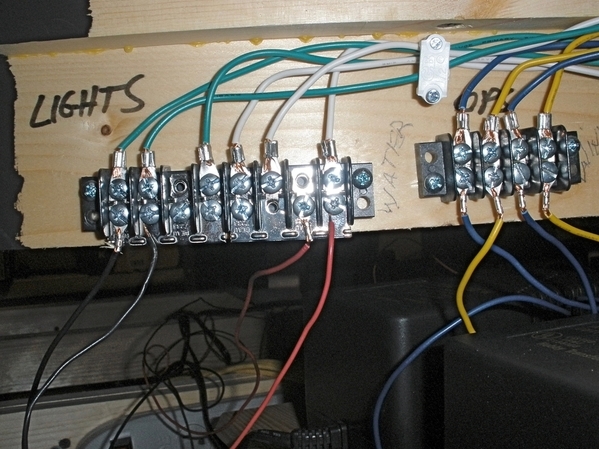 Accessory Hot wiring Picture center, above the Lionel command base. Track hot wiring, 8 track circuits. Top left. In my staging room their are 16' long double stack storage tracks on a hollow knee wall covering the sewer line. 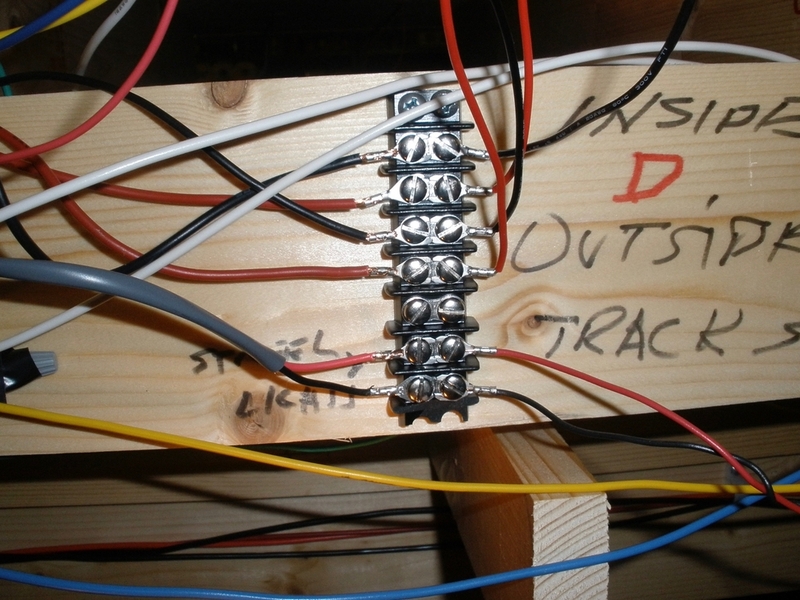 I dropped the 18 ga feeder lines into the hollow void and used a coat hanger to bring them forward through the top of the knee wall and dropped them down into an oversized 3/4" siding "J" channel. At that point they are spliced into a 14 ga wire and run back to a terminal panel which slides out on drawer slides. 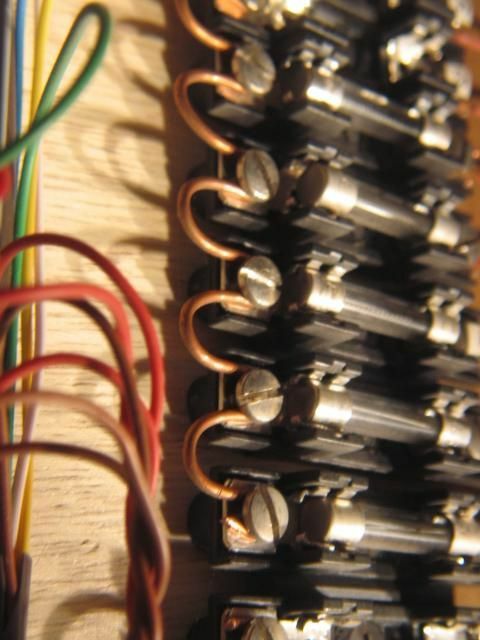 Above, the slots above are being cut so as to observe coupler action. The upper deck height allows manual access to any lower level cars. Below, the far left end has the main feed from the primary panel which comes in through a 1/2" pvc pipe in the wall to continue on thru the J channel to the small local panel. The left toggle chooses local or main control, the right toggle selects AC or DC for that area alone. My main panel also rides on drawer slides which makes work easy. The panel hinges up and the MTH blocks roll out. 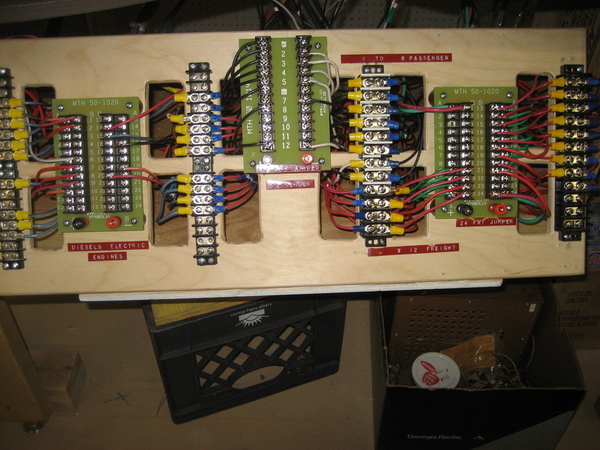 Note tape colors on the panel which translates to power pack tape colors and terminal strips. Colored thumb tacks denote block feeders for now. 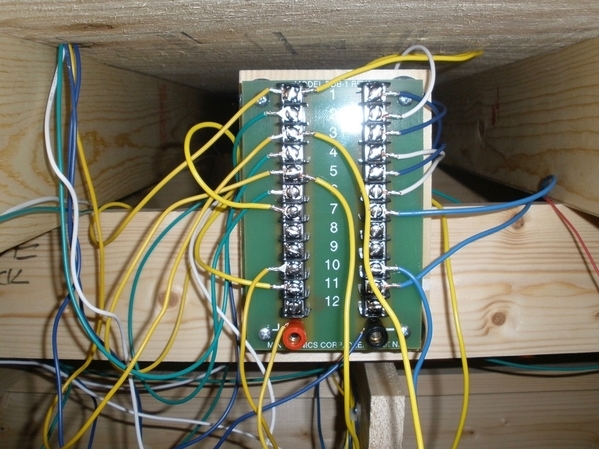 Plus number tags on wires and terminal strips match the toggle tag on the panel. 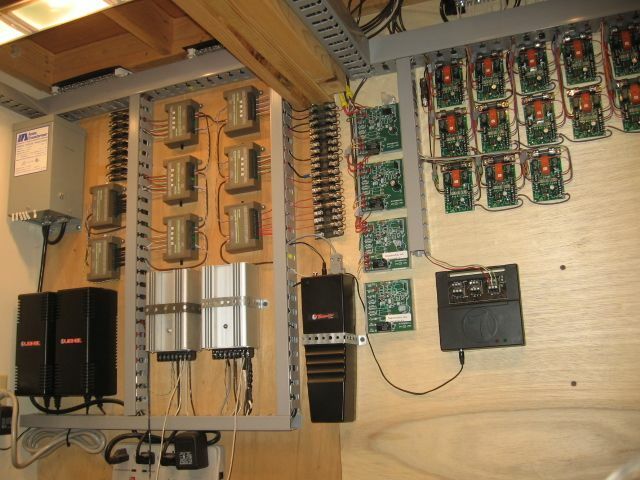 Although I am running switchable DC or AC conventional cab control around 200' of walls. I can choose to walk around the entire basement and select to control each train under either discipline and take local control at each town section without affecting train operation anywhere else on the layout. When the main panel sends a through train into any one of 7 locally operated perimeter towns I can throw a switch and allow the main panel full temporary control while traveling through that town being switched. As life goes on I no longer relish crawling under a layout. Mike and Tom, many thanks for your ideas and pictures. 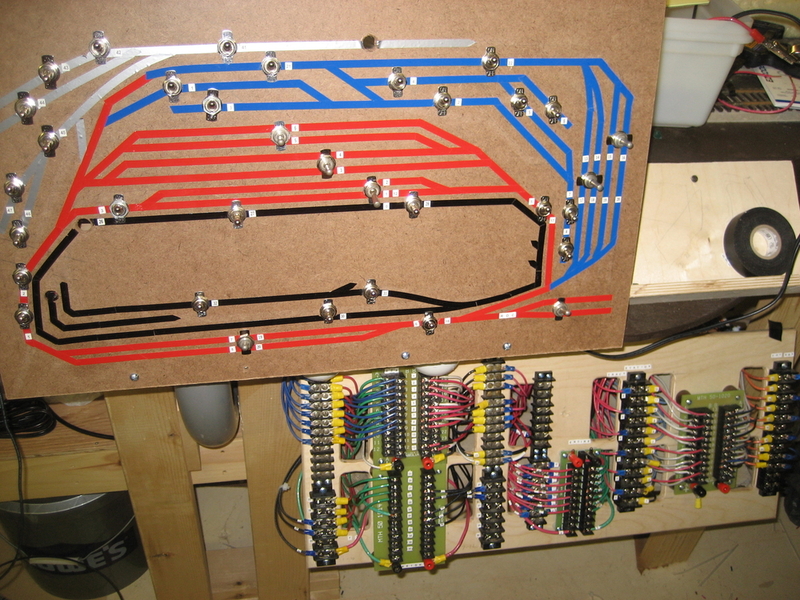 Everyones wiring ( Susan, Mike and Tom) is exceptional. Another thing to consider is an aisle positioned terminal board for service at chair height. It is mounted just below the platform and set back a little from walking knees on an angle for ease. Made installation very comfortable. 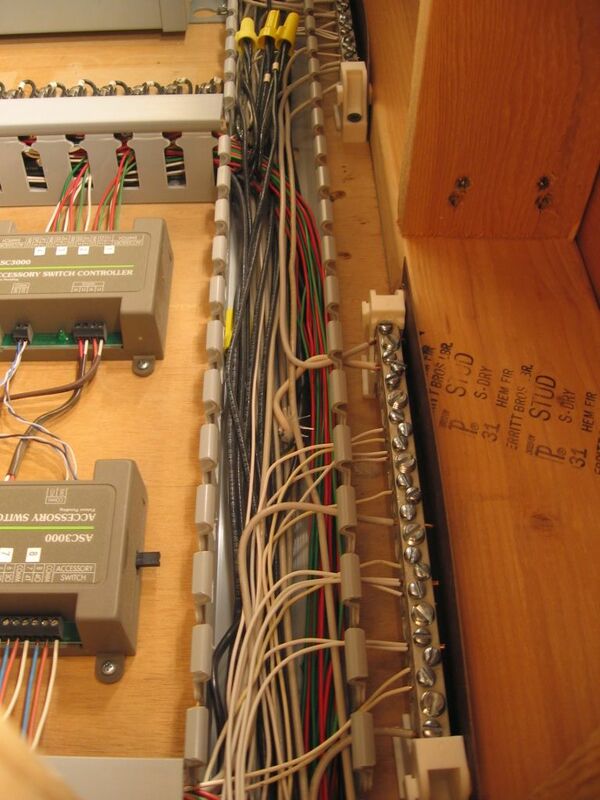 The track diagram panel hinges down held in up position by magnets. 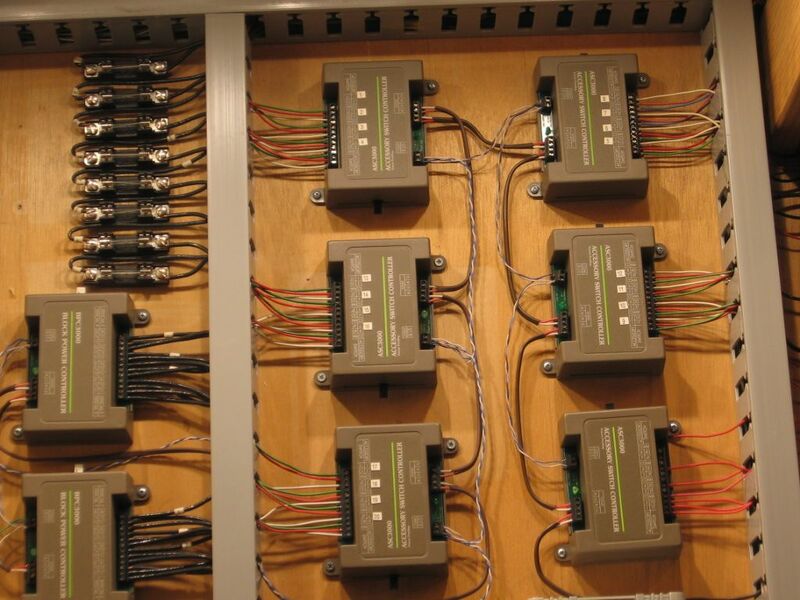 These two panels can also slide back and forth for service and protection. Note proximity of aisle leg lower left. Due to having a lot of aisle facing panels I also space several rolling office chairs around the train room for comfortable ease of service. Tom Tee and Turtle2 those are great solutions and will really help when I build the new layout with all the wiring at "surface level"
Thank you to all for the great ideas and pictures.